The Washington City Paper is a U.S. alternative weekly newspaper serving the Washington, D.C., metropolitan area. It was started in 1981 by Russ Smith and Alan Hirsch, the owners of the Baltimore City Paper. For its first year it was called 1981. The name was changed to City Paper in January 1982 and in December 1982 Smith and Hirsch sold 80% of it to Chicago Reader, Inc. In 1988, Chicago Reader, Inc. acquired the remaining 20% interest. In July 2007 both the Washington City Paper and the Chicago Reader were sold to the Tampa-based Creative Loafing chain. The former Chicago Reader Inc., now named Quarterfold, still owns the building that houses Washington City Paper as well as minority stakes in other alternative newsweeklies. In 2012, Creative Loafing Atlanta and the Washington City Paper were sold to SouthComm. The City Paper is distributed on Thursdays; its average circulation in 2006 was 85,588. The paper's editorial mix is focused exclusively on local news and arts. Michael Schaffer was named editor in April, 2010, two months after Erik Wemple resigned to run the new local startup TBD. Amy Austin, the longtime general manager, was promoted to publisher in 2003. The owner of the Washington Redskins Daniel Snyder filed a lawsuit against the City Paper for a cover story that portrayed him in a negative light. The District Line, a section of shorter news features about D.C.
City Lights, a section comprising critics' events picks. ^ Lowman, Stephen (August 9, 2009). "City Talk: The key players of Washington's influential and controversial weekly paper look back on its legacy". Washington Post. Retrieved October 19, 2012. ^ Miner, Michael (August 23, 2007). "The Suit Behind the Sale". Chicago Reader. Retrieved October 19, 2012. ^ Celeste, Eric (2012-07-03). "Nashville-based media company SouthComm acquires Creative Loafing Atlanta and Washington City Paper". Clatl.com. Retrieved 2014-04-13. ^ Shott, Chris (2010-04-27). "Michael Schaffer is New Editor of Washington City Paper - City Desk". Washingtoncitypaper.com. Retrieved 2014-04-13. ^ McKenna, Dave (2010-11-19). "The Cranky Redskins Fan's Guide to Dan Snyder". Washington City Paper. Retrieved 2014-04-13. ^ Sommer, Will. "Loose Lips - All About D.C. Politics". 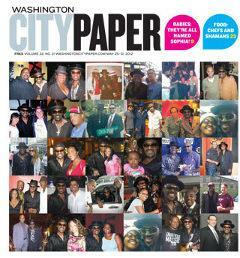 Washingtoncitypaper.com. Retrieved 2014-04-13. ^ Pipkin, Whitney. "Young & Hungry - D.C. Restaurants and Food". Washingtoncitypaper.com. Retrieved 2014-04-13. ^ Wiener, Aaron. "Housing Complex - D.C. Real Estate, Development, and Urbanism". Washingtoncitypaper.com. Retrieved 2014-04-13.